At Colgate we have something called the Colgate Hello. It means that when you walk around campus everyone says hi to each other. This may not actually happen all the time at Colgate, but it definitely does happen on any outdoor trail in New Zealand. Therefore I’m calling this the New Zealand Hello. Every hiking trail we walked on, every single person you passed said hello. Sometimes they would ask how your day was going or make a comment on the weather. It was like everyone on the trail was instantly your friend because you both decided to walk outside. At the end of the Abel Tasman track we had to walk back into town to get the car. We weren’t on the trail any longer but were walking on a path on the side of the road just past the park entrance. People still said hello as we passed. Frank turned to me and asked, “When do we stop saying hi?” “No idea.” It was a gray area: no longer hiking trail but not yet city street. Is this still NZ Hello territory? The default answer is yes, because really everywhere in NZ is NZ Hello territory. Those friendly Kiwis. I have a crush on a supermarket. NZ was shockingly expensive when I arrived so a lot of the food I ate there came from supermarkets. There were a few to choose from but my favorite was New World. New World gets the backpackers needs. Not only do they provide free wifi (I spent an hour in the entrance of the Kaikoura New World so I didn’t have to buy wifi) but they have the best prepared food section I’ve seen. The sandwiches became a staple of any long trip, whether a ferry or bus ride, the salads were good, and the pizza was cheap ($3, although disappointing, sorry NW you messed this one up a bit). The best way to shop at New World as a solo backpacker was going straight to the prepared food section and finding the “Reduced to Sell” items. Usually some kind of salad – couscous, veggies and rice, garden salad – these items were made out of fresh produce so they had to sell quickly or they would go bad. Anything that didn’t sell fast enough was marked down, usually at least half price, so it would not go to waste. Since I was not stocking a kitchen but looking for an immediate meal these were perfect for me. I had a delicious couscous and broccoli with bacon lunch for just $2.50, a Thai curry soup dinner for $3, or a side salad for my pizza for just $1. I wish New World existed everywhere. It was a real budget helper, and the food at least felt much healthier than most other budget food options. I ended my month in New Zealand back where it began – Auckland – but now that the culture shock was gone and I was lucky enough to have a local tour guide this revisit was nothing like my first time there. Auckland has a lot more to offer than I realized, probably because most of what it has you need a car to get to. I couldn’t have had such a great second visit there if it wasn’t for Kevin, a friend from my NYC days who just happened to be back home in Auckland while I was in town. Fate! Kevin showed me a great mixture of Auckland activities, from hiking days to indulgent desserts, so that the next time I hung out with a bunch of Kiwis from Auckland (which incidentally was my next few days in Sydney) they were surprised when I said I liked my time there. In short, over the course of 5 days we: hiked up One Tree Hill to see the sprawl of the city from above; wandered the trails around Piha beach, from a jungle walk to a three-tiered waterfall to the vertical hike up Lion Rock, a huge rock in the center of the sparkling black sand beach; had huge green NZ mussels (forever ruining for me the normal tiny mussels in the US); climbed the volcano Rangitoto Island; finally had some great NZ fish and chips while checking out Mission Beach; went to probably the best dessert restaurant I’ve ever been to, Chocolate Boutique in Parnell; went wine tasting on Waiheke Island; checked out a fantastic light art show at the Auckland Art Gallery followed by more delicious desserts, this time Chocolate Lahroaig ice cream at Giapo; had a true NZ steak and cheese pie (#2 in the city) in Ponsonby; and saw one final volcanic crater with a view of Auckland from Mount Eden. Add in some great hot tub and sauna sessions at the apartment complex and the amazingness of staying in a home with Kevin and his dad, a room to myself, tea with avocado and honey on toast breakfasts, and some fantastic home cooked dinners, and it’s clear why this return to Auckland left a much better impression than my first round there about 4 weeks earlier. My final days in Auckland were the perfect end to a month in NZ. Much like leaving South America by staying put in BA for an extended time, staying with a friend in his home was the perfect recharge before my next phase. I really can’t thank Kevin and his dad enough; I was so lucky to have experienced such amazing hospitality. When I got to the airport (at way too early an hour, the gates weren’t even open yet) I felt ready to move on to Australia and happy with the time I had in the great country of New Zealand. I have come to accept that there will always be more to see in the countries I’m visiting on this trip, but I left NZ satisfied with my experience. My last morning on the South Island I woke up for sunrise. Kaikoura is on the east coast of NZ, and was supposed to have one of the best sunrises on the island. I figured it had been a while since I saw a sunrise and it fit in with the calm vibe I already had going in Kaikoura, so I set an alarm for 5:45 and went to sleep to the sound of the rain, hoping it would clear up by morning. When I woke up I peeked out of the window and saw clouds but with a patch of sky. That was enough for me. I layered up, made some tea, and went out the back gate to the beach. Dawn is so peaceful. It was just me and the seagulls waiting for the sun. I sat on the black rocky beach and listened to the waves crash in front of me. It was still cloudy, but light enough clouds that I could see the light changing. I got outside early enough to glimpse the thin white sliver of the moon before it disappeared for the day. Then everything was lit up pink. Patches of clouds were highlighted with a pink glow that reflected in the ocean, and for a perfect brief moment a pink light illuminated the snowcovered mountain tops. I alternated between staring and snapping tons of pictures. As I was taking a video of the waves and the changing light, the sun broke the horizon. There was just a little opening in the clouds at the horizon line, and it was right where the sun came up. Most sunrises are beautiful but they’re all along the same lines: the sky gets lighter, the sun peaks up over the horizon, and in a matter of minutes it’s up in a clear blue sky. This one was different because of the clouds. The sun had a small window to appear, just enough to see it rise and immediately hide again behind cloud cover. It’s hard to describe but this somehow made it even more special. The rays of light coming from behind the clouds could only be described as heavenly. Before I left the beach I said goodbye to the South Island. I had an amazing couple of weeks there and can only hope that one day I’ll make it back across the world to this incredible place. I couldn’t imagine any better way to leave though than watching the sun rise over the ocean with rocky mountains to my left and grassy ones to my right; the ever-present contrast of NZ landscapes. It is impossible to go to Christchurch and not be struck by the destruction that is all around. The earthquake happened over 3 years ago, February 2011, but the aftermath is still present throughout the city. The City Center is a mixture of empty plots, collapsed buildings, construction sites, and, what seems like the smallest percentage, functioning buildings. The Cathedral remains half in ruins, a prominent reminder of what happened and how long the process can be to fix it; some people want it rebuilt like it was, others want it torn down and replaced, so it stands in limbo, surrounded by a decorated chain-link fence, awaiting its verdict. Part of the city has been zoned as condemned; it will be turned into green space because it is permanently unstable for buildings. After talking with Alana and Sarah about the process of trying to buy a house – if the house can be bought it often needs the foundation and cracked walls to be fixed before it can attain the proper insurance, a costly process – I realized just how widespread the damage goes, affecting what used to be normal decisions, and why so many people left Chch after it happened. It is easy to see why people who visit Chch leave with an impression of sadness. But the city is recovering. I left Chch optimistic. The city has devised a plan to rebuild Chch. They have already successfully used alternative materials to make new structures: in the Re:Start Mall shipping containers house shops, cafes, and bathrooms; and Shigeru Ban created a temporary Cathedral out of cardboard tubes, timber, steel, polycarbon, and shipping containers. Interesting disaster relief architecture has sprung up in Chch. Public art is everywhere – murals on the sides of dilapidated buildings, sculptures commemorating the quake, artistic seating covered in grass and flowers, and the aforementioned decorated chain-link fences – turning destruction into beauty. I spent half an hour in the Rebuild Christchurch office talking about the master plan for the city. (Probably an unprecedented amount of time. When I walked in one of the guys halfheartedly showed me a video, but once we got talking and they found out what I used to do they showed me the marketing materials and planning documents and we played with their high-powered Google Earth for a while. Interesting people.) They are turning an unfortunate incident into an opportunity to change Chch for the better. They’re implementing new zoning, new transportation and pedestrian plans, and adding more public amenities. It will still be a few years before it’s realized but it has begun. Aside from all of this rebuilding there is a reason Chch is called the Garden City: it still has great parks all around. I could have spent a day just wandering around the wonderful Botanical Gardens. So yes, Christchurch is still hurting from the earthquake, but I chose to look beyond that destruction and see the vibrant city that is trying to come out of it. It’s still early but it’s happening. If you don’t like construction, don’t go there just yet, but I for one am very curious to see what it will be like in a few years. Christchurch, I’ve got my eye on you. It was already evening on Wednesday when I stepped off the NakedBus in Christchurch (my new mode of transportation now that Fez had been returned, courtesy of the generosity of Josi and the remaining trips on her passport, another traveler-helping-traveler moment that saved me both logistically and budgetarily). I had no idea where I was going to sleep that night. After experiencing some sticker shock at the cost of hostels in Christchurch (Chch), I thought I would try my luck at couchsurfing. 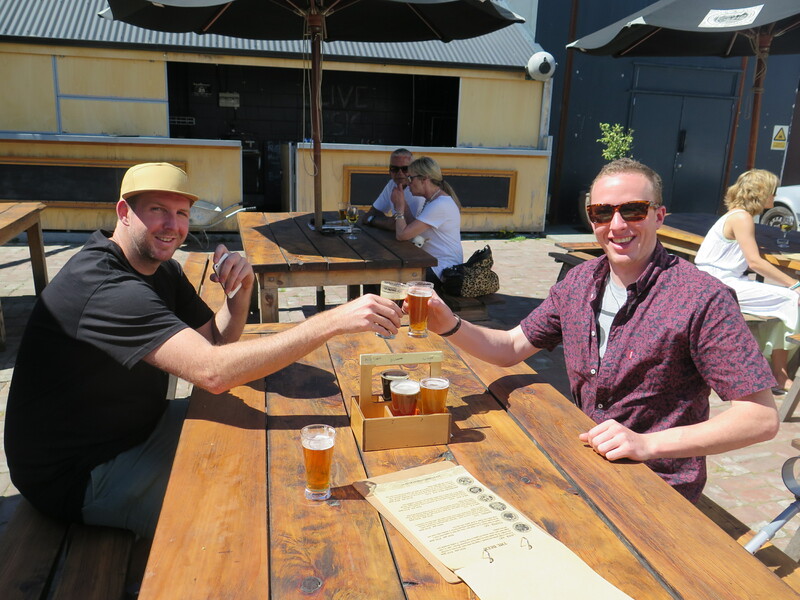 On the website there is an option to put out a public message to couchsurfers in a location that you are on your way and need a place to stay – something along the lines of “First time in Christchurch, hoping to see what the city has to offer and share a beer with some new friends” – and hosts can contact you. I had been in contact with a couple people but nothing was resolved yet by the time I got on the bus. I had a back-up plan of the YMCA for NZ$30 for a dorm bed. The cheapest option in town. Luckily I had a map of Chch that showed the locations of free wifi in town. I logged on and had a message: “When do you arrive? I can pick you up.” Max was my age, a couchsurfer and host with nothing but positive reviews. He was an avid traveler who enjoyed hosting other travelers, as long as he wasn’t at a festival. Sounded like someone I would get along with. I responded that I had arrived and was just mooching off the free wifi, unsure he would get my message. Within minutes he responded asking where I was and saying he would pick me up in an hour. It was 7:30 pm. I waited, with all my belongings on my back in a public plaza in a city I didn’t know until 8:30. This was one of those travel moments where you just have to have faith; I could be stranded if he doesn’t show up, I could be murdered either way, or I could have a fantastic story. 8:30 came and so did Max’s car, complete with Max and two more friends. They enthusiastically pulled up, pointing in my direction with smiles and “hey’s!” all around. Max jumped out and introduced himself, threw my stuff in the trunk, and I got in the car with these friendly strangers. Quick introductions all around and off we went to Max’s place. I had the fantastic story. This experience was a complete 180 from my initial foray into couchsurfing back in Salvador. Max and all his friends were gracious hosts. For the next three days they welcomed me into their lives and showed me part of Chch that you don’t get to see from a hostel or guidebook. That first night Max and co. (his car companions Louie and Tim and his brother Jake) and I hung out playing Cards Against Humanity – apparently this is a brand new game in NZ, which was surprising coming from the States where it has been a favorite for a couple of years now, which may have given me a bit of an unfair advantage leading to a crushing victory – and generally got to know each other. A large part of this required translation from Kiwi into regular English. This is when I learned the meaning of Sweet As, Hard Out, ae, and fush and chups. The next day Max and I strolled along beach-side in the suburb of Sumner where he grew up, swapping travel stories, before he, Louie and I had some tasting beers at a local brewery and drove up to a lookout where you could see all of Chch and neighboring Lyttelton below. Max dropped me off to explore the city center that afternoon, telling me some places worth checking out while went off to work. That night he brought me to his brothers’ house for some garage beer pong before we all went out in town. Saturday was slow to start due to the activities of the night before and the bad weather, so when Max proposed a day of chilling in various locations before another night out it sounded great. We kept Braden company while he worked on building an impressive sound system and stopped by his brothers’ house for a quick FIFA session before the night, when we started at Braden’s house for pre-club drinks. I got to know Sarah and Alana over daiquiris while the guys played more beer pong and then we all jumped in a van taxi and went to a club for a typical Chch drum and bass show. I definitely experience some fun Chch nightlife while I was in town. Needless to say my 7:00 am bus to Kaikoura the next morning was a rough one. What I’m hoping to describe with a summary of those few days is how, when you have a great couchsurfing host like Max, you get to see the real life of a place. I have impressions of the city of Christchurch, which will get a post too, but I wanted to first say how fantastic it was to spend a few days with some great people in this new place. In the chance that any of them read this, thank you all. You completely changed my couchsurfing experience to an incredibly positive one and I hope to be a part of this community for a while, eventually hosting people in SF whenever I get back. Which includes all of you – any time you want, come stay with me so I can return the favor. My experience in Chch would not have been the same without taking the chance to try couchsurfing again and I’m so happy I went for it. I can now recommend trying this accommodation option when you’re in the right place for it. Of course NZ is a great place for it, so I had a great weekend. Or as the Kiwis would say – it was heaps as sick though cuz, flat out chur.